The most exciting gem at this year's Tucson gem show was a rare Purple Garnet from East Africa. There were specimens from deposits in Tanzania and Mozambique, with the finest material coming from the Mozambique mine. Indeed, the top grade pieces were among the most beautiful garnets we've seen anywhere. We were lucky to be one of the few dealers able to acquire some of the finest of these unusual gems. 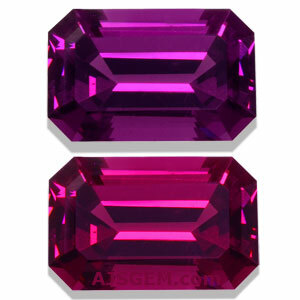 What's special about these garnets is the wonderful color -- an intense purple with red flashes that we call Royal Purple. The Mozambique material in particular has a bright open color with wonderful brilliance. If this wasn't enough, these garnets also display a fascinating color change, from grape under daylight to cranberry with magenta flashes under incandescent lighting. Spectrometry showed that the material was a pyrope-almandine garnet with the following chemical components: 48.8-59.5% pyrope, 37.9-47.6% almandine, 2.0-3.5% grossular, and 0.5-0.6% spessartine. Though the chemical composition classifies these gems as rhodolite garnet, analysis of the absorption spectra showed some unique properties. Since the main absorption bands dominate the green-yellow regions of the visible spectrum, two strong blue and red transmission regions combine to produce an eye-visible purple color, and also account for the strong color change. Under cool light these gems display a rich grape hue. But under incandescent light, which has more wavelengths in the red part of the spectrum, these gems display a blazing cranberry color with magenta flashes. Under balanced lighting, they are an intense purple with red flashes. Unfortunately the Mozambique deposit is in a politically unstable area of the country under the control of the Mozambican National Resistance, an armed rebel group. The government has now closed the area to mining and we don't know if and when we will find this material again. So the usual maxim of the gem trade applies -- buy it while you can! This month we feature a beautiful assortment of the finest quality Royal Purple Garnets from Mozambique. A gorgeous matched pair of the finest quality Royal Purple Garnets from Mozambique. This is beautiful clean material with a vivid open color, excellent fire and a strong color change. Very good size for these rare garnets. Guaranteed natural and untreated. A superb example of the finest quality Royal Purple Garnet from Mozambique. This is the largest single gem we cut from the highest grade material and its a real beauty, with an intense color and wonderful brilliance. Bright open color with full fire, and a strong color change, this rare gem will make an important addition to your gem and jewelry collection. Guaranteed natural and untreated. A top grade Mozambique Royal Purple Garnet in an elegant emerald cut. The large facets really maximize the rich color. Excellent brilliance and a strong color change. This fine garnet will set up beautifully in a ring. Guaranteed natural and untreated. A splendid matched pair of top grade Royal Purple Garnets from Mozambique in an elegant emerald cut. Outstanding brilliance and a storng color change. These rare garnets will make a stunning pair of earrings and could form an impressive set with the 3.18 ct emerald-cut garnet above. Guaranteed natural and untreated. A lovely matched pair of the top quality Royal Purple Garnets from Mozambique. This is beautiful clean material with a vivid open color, excellent brilliance and a strong color change. These rare gems will set up beautifully in your jewelry design. Guaranteed natural and untreated. A superb example of the finest quality Royal Purple Garnet from Mozambique. This is one of the largest gems we cut from the highest grade material and its a beauty, with an intense color and wonderful brilliance and luster. Under cool light, these gems display a rich purple hue, changing to cranberry with magenta flashes under incandescent light. These rare gems will set up beautifully in your jewelry design. Guaranteed natural and untreated. Sotheby's will auction the 59.60 ct Pink Star Diamond in Hong Kong, 3 years after the previous sale of the gem fell through. 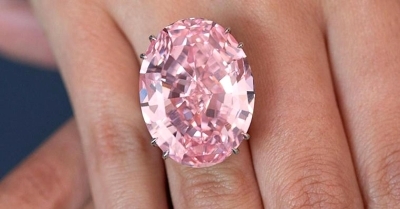 The huge IF fancy pink diamond sold for $83.2 million in November 2013 to diamond cutter Issac Wolf. However, the stone was returned to Sotheby’s after Wolf and his investors defaulted on the payment. The diamond is expected to sell for more than $60 million, which would rank it among the most valuable diamonds ever sold. You make a very good point, but one that is not without its risks. We do recut gems as well, but the advisability of a recut has to be considered on a case by case basis. Some gems will change color when recut, often not for the better. And there is always the risk of cracking or breaking a stone in the process. The value of a gem may also be affected by a recut, due to weight loss. So it's a step not to be taken lightly, as I'm sure you know. But fortunately gold is more malleable than gemstones. Thanks for using our mobile website. We've noticed that 50% of our visitors are now coming to the mobile version of our website, and we've tried to make the checkout process as simple as possible. 1. Let your browser do the work. All of the popular mobile browsers (Chrome, Safari, Firefox) support an Autofill function that is a big timesaver in filling out web forms. Look in the advanced settings for your particular browser to turn on Autofill. The autofill function won't save sensitive credit card data unless you explicitly authorize it, so this function is quite safe to use. 2. Login to your AJS Gems account. If you've purchased from us before, you can login to your account before you checkout, and we'll fill in the address information for you automatically. But you don't need an account to purchase from us, so the Autofill function might be easier than having to remember yet another login and password.